I must confess. I’m guilty of the last one. The signs were there all the time, boo boo. You were just too busy to recognize them. 1) You have ideas, dreams and goals, but right before you’re about to begin, you take a deep breath and youuuuu … hesitate. You start thinking and, before you know it, you’re caught in an analysis paralysis. Every fiber in your rational mind is calling out the obvious reasons why you should NOT proceed. Any of these sound familiar? 2) You see everything in black and white. What words would you use to describe your everyday life? Bleak? Monotonous? Painfully boring and predictable? Or have you even given any thought to how your life is right now? Are you always in go, go, go mode? 3) You apologize way too much. For stuff that needs no apology. Are you a “I’m sorry, but …” and then you proceed to insert your opinion type of person? Do you feel yourself shrinking when you’re speaking? Or speaking really fast so that you get it over with? Or soft so they don’t really hear you? Or throwing out a “Never mind” after a little back and forth because it’s just too overwhelming to explain your stance? Or just not saying anything at all? If any of this resonates with you, congratulations. Awareness is a tricky thing -- once you know better, you pretty much have to do better. It is virtually impossible to go back to your ignorant bliss. You can’t unsee it. Therapy. Life coaching. The point is that oftentimes it helps to get outside perspective and ideas. Also, there is nothing wrong with asking for help. We are all doing the best we can with what we have. There is no shame in it. I’m of the mindset to do anything that will get me ahead of the game. Faster. 2) Make a list of things you want to try. And go for it. It’s your version of Eat, Pray, Love. I’m not saying quit your job and travel, but if the spirit moves you, do you, boo. Journaling is a powerful way to get in touch with yourself. Don’t have much time? Set your timer for 10 minutes and put pen to paper. Or open up a Google doc and have at it. Let your truth spill onto the pages unapologetically. There’s a fantastic saying in Spanish, “No dejes para mañana lo que puedas hacer hoy.” *LaTisha’s Loose Translation: Don’t put off till tomorrow what you can do today. You have something inside of you to share with the world. And, don’t get it twisted. This doesn’t mean that every single person in the world is the next Beyoncé. Nor should you want to be. Your world could consist of your family and friends. Or it could mean selling out Madison Square Garden. The definition is up to you. The point is that you have something inside of you that you are born to share — a message, a song, a painting, a book, a business, etc. I’m gonna ask you for a big favor. Please stop robbing us of your genius because you’re scared. Or worried. Or whatever it is that makes you second guess, hesitate, and put yourself on the back burner. You’re a rock star. It’s time to own it. Now it's your turn. 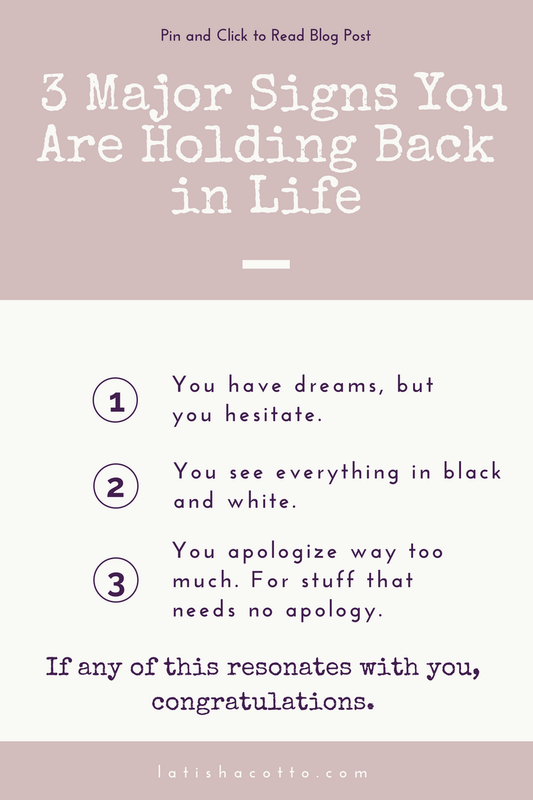 Comment below and let me know in what area of your life you are holding back and one small step you can take to move forward. I'm cheering for you. Like you are the Beyoncé of your life.